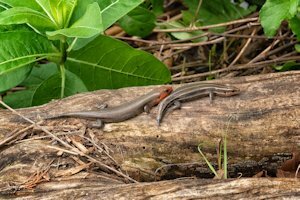 Rusty Moran took these photographs in Dyke Marsh on May 23, 2018, of the common five-lined skink (Plestiodon fasciatus), which is on average five to seven inches long and generally prefers moist habitats. Males lose their stripes and have reddish heads during the breeding season. For more information on skinks, visit http://www.virginiaherpetologicalsociety.com/reptiles/lizards/lizards_of_virginia.htm. In these photos, the colorful one in the first picture is a juvenile. The pair are male and female adults. The male, with the reddish coloration on the head, was intent on mating.